Dear Readers, the ostentatious blooms of the rhododendron are popping up all over St Pancras and Islington cemetery, and can be spotted in great profusion on the Kenwood estate of Hampstead Heath. What remarkable plants they are! Their blossoms come in all shades of blue, white and pink, and because they are shade-tolerant, they are happy to grow in the understorey of woodland. Once established, their leathery leaves shade out everything else, and the plant grows into great thickets that bulldoze aside anything more delicate (which is pretty much everything). Although they prefer acid soil, they are happy to give more or less anything a go, and frequently outgrow their space. As it says in my copy of Harrap’s Wild Flower guide, ‘the control and removal of rhododendron is a major headache for conservation managers’. And yet, on a warm day last week, the blooms of one plant were full of bees, and the sculptural flowers were back-lit by the sun. Was ever a shrub so beautiful, and yet such a problem? Who would have thought that this showy flower is part of the Ericaceae (the heather family)? And yet, its liking for acid soil is a clue. Rhododendron species (the word comes from the Greek for ‘rose tree’) are found mainly in Asia, but there are also some native species in the Appalachians in the US. The one that is found most often in the UK, Rhododendron ponticum, was native prior to the last ice age, which wiped it out: it was reintroduced in 1763 (it is now native to Europe east of Georgia, right through to northern India and the Himalayas), and was first recorded wild in western Europe (Spain) in 1894. It is probable that it made its escape from some of the great Victorian estates and gardens, and can now be found dominating many woodlands. To return to the bumblebees: it’s lucky that we rarely eat bumblebee honey, because that produced from rhododendron nectar can be poisonous. causing a dangerous drop in blood pressure in any human eating a sufficient quantity of the stuff. 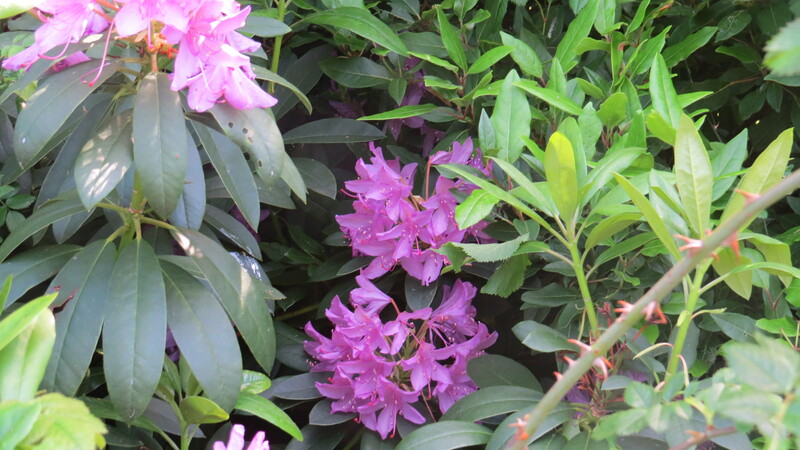 This is because rhododendrons contain a toxin called grayanotoxin. There are several accounts of the effects of rhododendron poisoning on troops in classical literature – Xenophon mentions the ‘odd behaviour’ of Greek soldiers who had been feasting on honey made from the rhododendrons that surrounded a village where they were billeted in 401 BC, and casualties were noted amongst Pompey’s forces after they ate honey that was left for them by Pontic soldiers – literally a ‘honey trap’. More recently, there were reports of eleven similar cases in Istanbul in the 1980’s. Honeybees don’t seem to be attracted to the flowers (at least in the plants that I’ve seen), maybe because the plant grows in heavy shade, and bumblebees are more tolerant of low temperatures than honeybees are. However, if honeybees do collect the nectar it also seems to be toxic to them, causing death within hours. 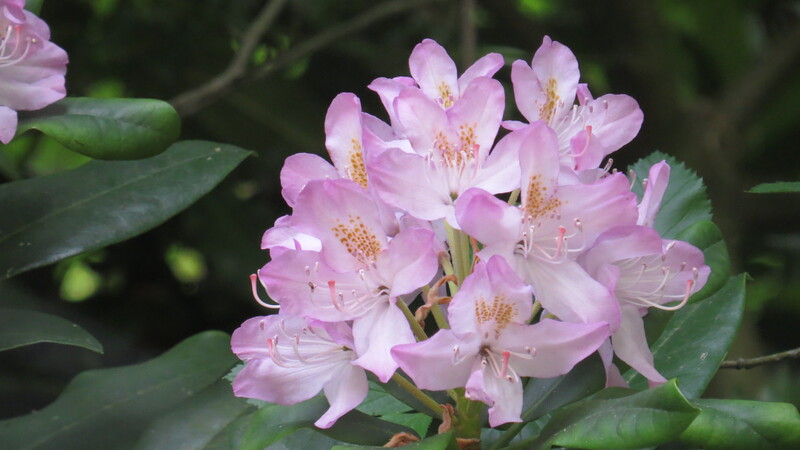 This makes the chance of humans dying from rhododendron poisoning seem rather unlikely these days, as the bees would not have much time to contaminate their honey stocks. 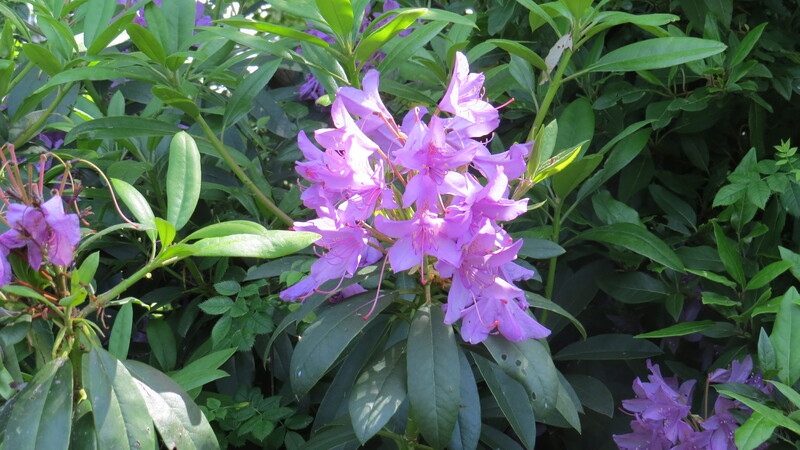 Furthermore, on the Poison Garden website, John Robertson mentions a belief that the toxicity of honey made from rhododendron decays over time, reducing yet further the chance of becoming ill. This is just as well, as a description of the symptoms of honey poisoning refer to its hallucinogenic and laxative effects. It seems typical of the paradoxical nature of the plant that it is so beautiful, and yet also fatal to some of those who feed on it. In spite of the grayanotoxins, many insects will eat the leaves of rhododendron, especially if there’s nothing else available. 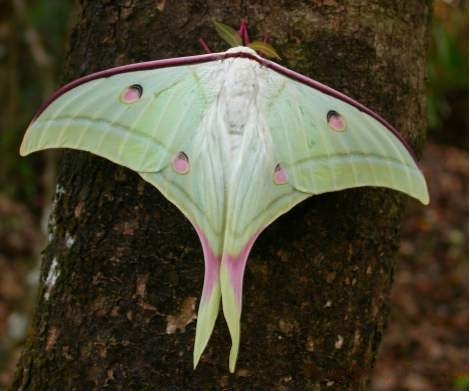 In their native India, such beauties as the caterpillar of the Indian Moon Moth (Actias selene) will tuck in happily. 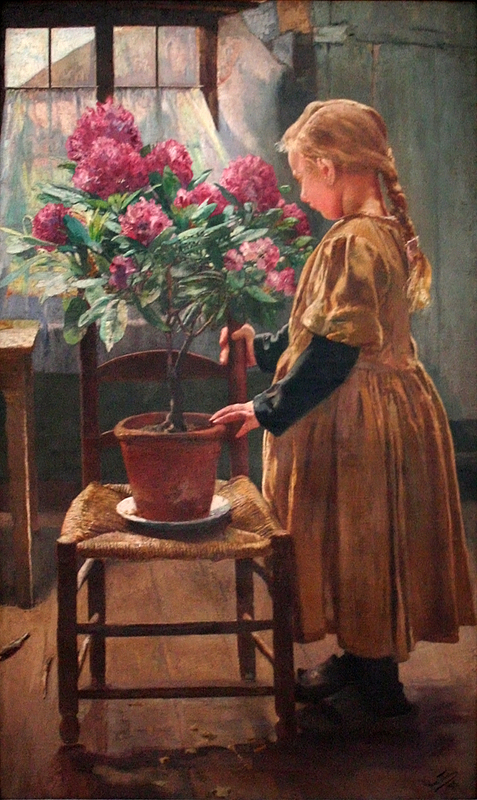 The beauty of the flowers has also inspired artists, amongst them the Belgian Symbolist painter Leon Frederic, who included them in his painting ‘Rododendron in Bloei’. The scene reminds me of the many intimate interior scenes of the Dutch masters, and I wonder what exactly the little girl is doing. Is she in a reverie as she looks at the intricate structure of the flowers, or is she, more pragmatically, wondering if it needs a drink? I remember how deeply I fell in love with individual plants when I was a child, and how distressed I became if they didn’t thrive. 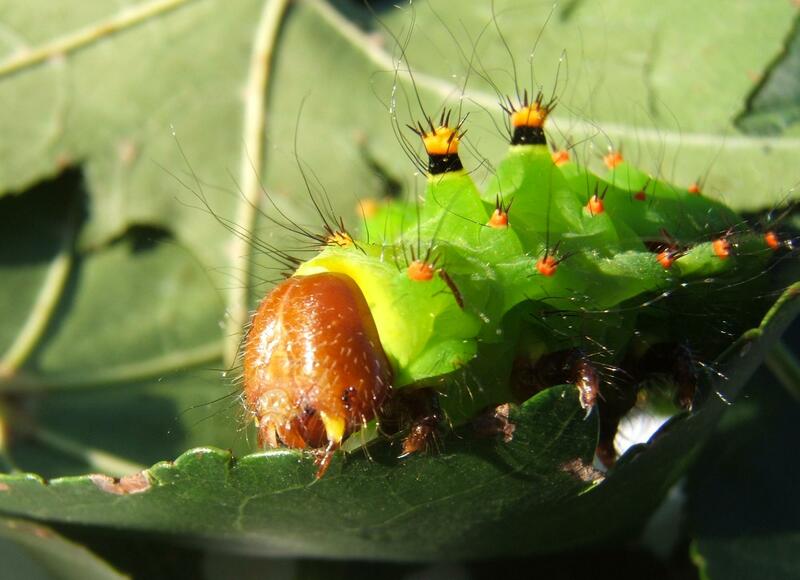 I once planted some cabbage seedlings with my father on our allotment, and nearly had a breakdown when they became infested with caterpillars. What should I protect, the baby butterflies or the baby cabbages? I seem to remember that my father quietly sorted out the problem when my back was turned with a hearty application of insecticide (well, it was 1968 and we knew no better). I was delighted with the recovery that my cabbages made after what seemed to my mind like divine intervention, rather than the paternal variety. I also can’t help thinking that, in view of its adventurous and enterprising spirit,keeping one’s rhododendron in a pot is probably an extremely good idea. All other photos copyright Vivienne Palmer. Free to use or share, but please attribute and include a link to the blog. This entry was posted in London Invertebrates, London Plants on June 22, 2016 by Bug Woman. 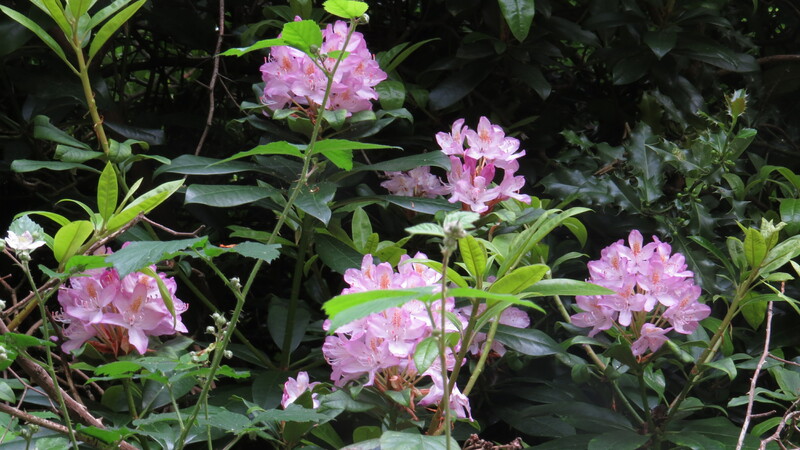 How thoroughly enjoyable it is to know the truth about the alluring rhododendron! During our many walks in the forest that bordered the house where I grew up, my parents took great pains to warn their wee ones never to eat the mountain laurel! We were wild little things, my siblings and I, but we never thought eating laurel seemed all that appetizing, those leathery leaves looking suspiciously akin to spinach, or worse, kale. A dear playmate insisted that no, mountain laurel wouldn’t do us in; it was rhododendron we were to avoid at all costs. I never gave the difference much thought, back then, being convinced by ever vigilant parents that putting any plant from the woods into my mouth would spell instant death, but your post inspired me think anew about both plants and whether they were one and the same, or entirely different. This little video explained it pretty well! Hi Katya, I’ll watch your video soon – I’m very intrigued!